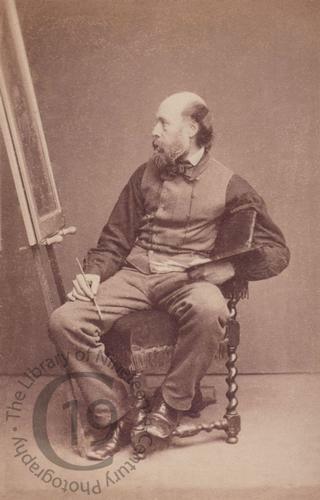 A carte-de-visite portrait of the British artist Paul Falconer Poole (1806-1879), who painted subject and genre paintings. His subjects divide themselves into two orders, one idyllic, the other dramatic. Though self-taught his fine feeling for colour, poetic sympathy and dramatic power gained him a high position among British artists. He exhibited his first work in the Royal Academy at the age of twenty-five, the subject being The Well, a scene in Naples. After his exhibition of the Surrender of Syon House he was elected an associate of the Royal Academy in 1846, and he was made an academician in 1861. In the 1850s he lived at 43 Camden Road Villas (now 203 Camden Road) near Camden Town. Photographed by John and Charles Watkins of London.